← A visit to Skokholm island ……. and the joys of running a business. Last week I made a return visit to the waterfalls described in a previous post – What………..me, guv? (Part 2). After an early breakfast in the van I set off on the steep and rugged walk down to the falls, kitted out ready for a long day by the river. It had been a still and very humid night – the midges were ravenous – and there were still signs of mist and fog in the valley. On arrival, about 7 a.m., I settled down with my back against the tree stump and began waiting to see what the day would bring. There was no sign of the kingfishers I had seen on my previous visit but very soon it became apparent that both grey and pied wagtails had young nearby. It took me rather longer to realise that a dipper was perched on a log just upstream, below the opposite bank. The valley bottom was still in shade, however, so I decided to walk the short distance back up to the falls themselves, and what a spectacular scene revealed itself there! In the still humid atmosphere each separate “step” of the falls was creating large volumes of fine spray. 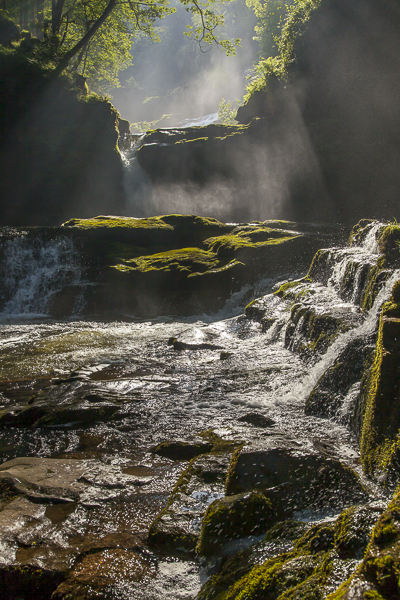 The sun had just risen above the rim of the gorge directly behind the falls, back-lighting the spray in a very dramatic fashion. It was rather a Stonehenge situation. Only very close to the summer solstice would this particular alignment of sunlight and landscape be possible, and the spray was an added bonus. My immediate reaction was “wow” and then “whatever do I do with this?”. The lighting was so extreme, and likely to be very short-lived, that I began work immediately without giving technique much thought. I set up the tripod and, relying on the camera’s meter reading, began taking photographs. I don’t often use a vertical format but this scene was crying out for it; there was too much deep shadow to left and right. Once my thought processes began to kick in again I experimented with various shutter speed/depth of field combinations which would produce different amounts of “flow” in the water. Over the next twenty minutes or so the quantity of spray gradually decreased as the sun rose and moved across the sky and I ended up with a selection of different compositions to choose from. With very high levels of contrast in the images I was grateful for the processing power now possible with Lightroom v4, in particular the separate “whites” and “highlights” sliders which I have now got the hang of! You can see one of the best above. After an exciting half-hour I returned to my post by the tree stump. The dipper was still there but very shortly after my arrival it began a short walk downstream towards me, feeding as it did. It continued until it was directly opposite me, at which point it entered the river and perched on a couple of rocks mid-stream. I followed it with my camera. I felt almost certain that it was checking me out. It flew back to its log, still in deep shade despite the bright sun. And for the next four hours it spent all its time either there or in the water nearby, preening and bathing. …. scratch …….. tug ………. stretch left wing out ……… stretch right wing out ……. stretch both wings up …… fiddle …….. tug ……. fiddle ……. splash ……. shake …. That’s the bird, not me. I had rather less to do. I did get a couple of nice pictures of the grey wagtails during this time – despite their almost constant activity – and although I didn’t realise it until later, I learned an unexpected lesson about birds and their way of life. After they have reared their young, small birds go straight into moult. They skulk and become difficult to see while they lose their old feathers and grow new ones. And this is what the dipper was doing. My photographs showed that it was not in good condition, some of its wing primaries in particular looking to be missing. Back at the falls, I noticed a juvenile dipper – probably reared in a nest nearby – a pair of grey wagtails feeding young, and a pair of spotted flycatchers visiting a potential nest site. A little higher up the valley came the gorge walkers. A party of twelve inner-city teenagers. It may do them good but I still question if river wildlife can cope with such high levels of disturbance. And in a “Special Area for Conservation” as well. It appears that my conversation with the National Park authorities had not yet borne fruit.